Securely strap down items for moving and more with this 12-piece Stretch Cord Set featuring strong cords in an assortment of sizes. 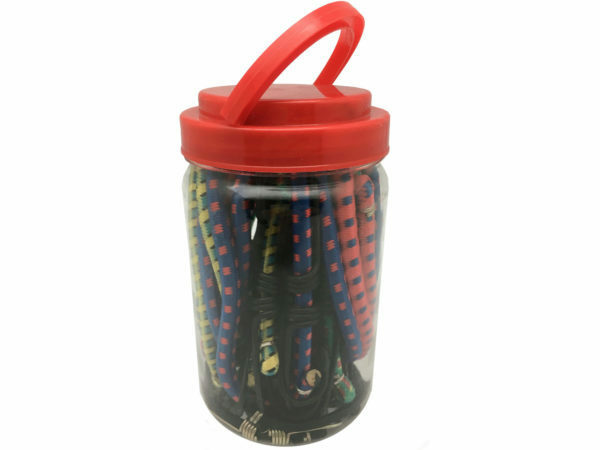 Durable, heavy duty elastic cords are encased in tightly woven nylon for lasting strength. Each end has a sturdy metal hook for easy attachment. Set includes: 2 - 10" pieces, 4 - 17" pieces, 2 - 25" piece, 2 - 32" pieces and 2 - 36" pieces. Comes packaged in an individual container with a handle. Container measures approximately 6" x 3.5".